Rajans Endeavour - Explore Himalaya Rajans Endeavour - Explore Himalaya team officially received the national flag from His Excellency Maithripala Sirisena, The President of Democratic Socialist Republic of Sri Lanka! Special Thanks Goes to Mr. Sadara Thennakoon (President of the DRCK OBU) and Mr. Thilina Thennakoon for arranging this meeting. 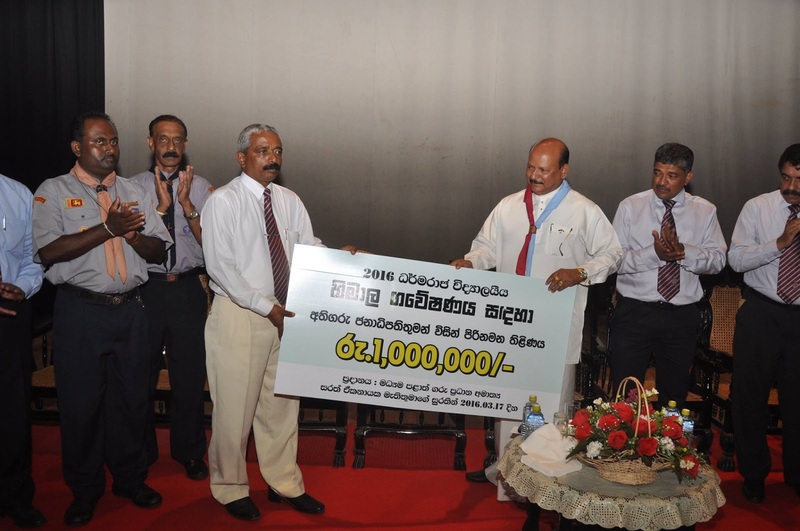 2016-03-17 His Excellency Maithripala Sirisena, The President of Democratic Socialist Republic of Sri Lanka donated Rs 1,000,000 to Rajans Endeavour - Explore Himalaya team presented by Mr Sarath Ekanayake (Chief minister central province) at Dharmaraja college auditorium. The 110th Battle of the Maroons between Dharmaraja College and Kingswood College, Kandy played for the TB Tennakoon Shield on March 18 and 19 March at the Pallekelle International Cricket Stadium, Kandy. Match draw. RAJANS After Battle - Dinner Dance 2016, the annual dinner dance of Dharmaraja College Old Boys' Union held after the 110th battle of the maroons at Earl's Regency Hotel on 19th March 2016. "Ahinsaka Prayogaya" stage drama show organized by Century group was held on 2016-03-26. Annual RAJANS CAR PARADE was held on 27th March 2016 (One day big match day) started from Gatambe grounds to Pallekale International Cricket grounds. The 26th One day encounter Dharmaraja College and Kingswood College, Kandy was held on March 27th March at the Pallekelle International Cricket Stadium, Kandy. Finally Kingswood team won the match by getting 4 runs for the last ball. Dharmaraja Vs Kingswood Rugby Match was held on 2016-04-02 at Bogamabara grounds. Dharmaraja College won the match. Dharmaraja Vs Science Rugby Match was held on 2016-04-09 at Airforce grounds. Science College won the match. You are the Sri Lanka's 1st Inspector General of Police chosen by the constitution council and appointed by the President. Congratulations! Dear Brother, Pujith you're a people friendly and clean police officer. March forward, we are behind of you.